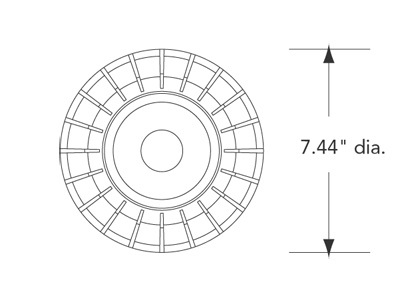 The EPL-CM-LED-R1 Explosion Proof LED Light from Larson Electronics is Class I, II and III rated for use in combustible sites and hazardous locations. This 15-watt LED light fixture produces 2,400 lumens of illumination with a 75 CRI rating. Waterproof and IP67 rated, this LED light fixture is offered in multiple mounting solutions and available with several color and voltage options. The EPL-CM-LED-R1 explosion proof LED light from Larson Electronics is ideal for industrial applications, hazardous work spaces, and areas where gases, vapors and dusts may be present and a powerful and durable general purpose light solution is needed. The lamp housing is waterproof, constructed of heavy cast aluminum, and tested to withstand 1490 lbs. per square inch of hydrostatic pressure. Factory sealed and finished in a durable polyester powder coating, this lamp can be ordered with 6000K (white), 4500K (white), 3000K (white), red, blue, green or amber light colors. Please choose a lamp color when ordering. When in use, the 15-watt explosion proof LED light offers 2,400 lumens of output with a CRI rating of 75. A full, 360° beam configuration provides comprehensive illumination over the work area. This light is universal voltage capable and can be operated with 120-277V AC, 50/60 Hz without modifications to the fixture, and a low voltage version of this LED fixture that operates on 12V DC or 24V DC for rigs and vision systems. The LED lamp in this unit offers exceptional power efficiency over transitional incandescent lamps, offers a 50,000+ hour lifespan and is energized by leads which pass through a sealing compound that separates the lamp chamber from the wiring compartment. The LED lamp assembly is protected by a heavy aluminum cage guard and an impact and heat resistant clear prismatic globe with heavy gauge aluminum reflector that affords excellent light control. 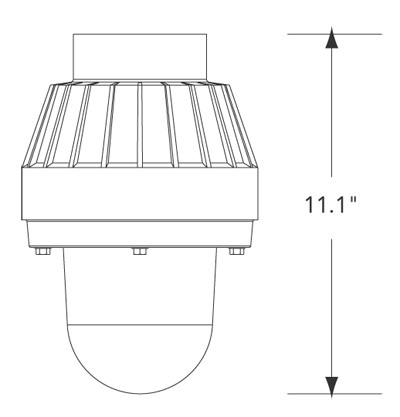 This hazardous area LED light carries a T3C temperature rating and is UL Listed Class I, Groups C and D, Class II, Groups E and F, and Class III. The LED light is IP67 rated waterproof and suitable for use in paint spray booths and areas where flammable gases, vapors and chemicals may be encountered as well as approved for exposure to combustible dusts. The cast aluminum housing is fully factory sealed and includes an integrated inspection hole for easy access to the splice compartment. Hub: The EPL-CM-LED-R1 is equipped with four, 3/4" NPT hubs for completing electrical connections. Mounting: This explosion proof light offers several mounting options including ceiling mounting, pendant mounting, and wall mounting. Ceiling mount fixtures mount via a flat surface mounting bracket with (4) 3/4" NPT knockouts for wiring the fixture in series and parallel via rigid pipe, utilizing the mounting base as a junction box. Wall mount fixtures mount to flat surfaces with the same style junction box mount as ceiling mount fixtures, but has an arm that extends the fixture out and away from the mounting surface to suspend the fixture over the illuminated surface. Pendant applications are mounted from the ceiling and are suspended by rigid pipe via the 3/4" NPT hub on the back of the explosion proof fixture. Wiring is fed through rigid pipe to the junction box and tied in to the fixture’s lead wires, completing the electrical connection. Suggested Applications: The EPL-CM-LED-R1 is approved for use within environments where flammable or combustible gases, vapors, dusts, fibers, and flying exist or stand the potential to exist, and is ideal for a wide variety of applications.